There are a minute and 30 seconds left in the game, SJU is down 2 points and the Davidson Wildcats have the ball. Hagan Arena is shaking with noise, excitement, and energy. The students chant “DEFENSE” as we stand in the student section on the opposite end of the court, hoping for a big stop. 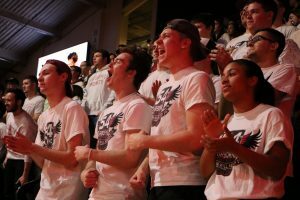 The Davidson player misses a jump shot and the Hawks get the rebound, our student section erupts in excitement, we have the ball down two with about a minute left on the clock and everyone is chanting “LET’S GO SAINT JOE’S!” The Hawks rush down the floor and our senior guard Chris Clover shoots a 3-pointer, as hundreds of students hold their breath. We watch it go into the hoop and now we go berserk, you are high-fiving everyone around you whether it is your best friend or another student you have never even met before. However, there are still 30 seconds left and we are only up one point. Davidson inbounds the ball, and everyone again is chanting “DEFENSE” with what is left of our voices after screaming all game long. As we anxiously watch knowing that Davidson has the last shot to try and win this game, they put up a shot with a few ticks left on the clock. The ball clanks off the rim and time expires. We all begin to celebrate: they missed the shot and SJU wins a THRILLER of a game! The best part about that story I just told, was that all this fun and excitement happened on what started as a regular Tuesday night. If I had not gone to the game, it would have just been a regular school night. There are a lot of things that I love about SJU: I love the people, the hardworking staff, and the beautiful campus; but my favorite part about my past 3 years has been the school spirit that we have. The spirit we have at SJU creates an amazing campus culture, giving students a universal commonality: that we love being Hawks. We take pride in our sports teams, our academics and our amazing school as a whole. As President of the 54thAirborne, I can attest to this spirit. 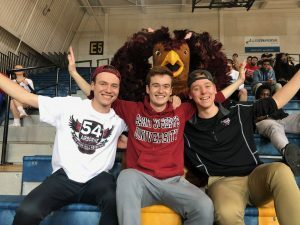 The 54thAirborne is a student booster club that creates spirit and energy at our Division I sports events, and it is one of the largest clubs on campus. I joined the 54thAirborne my freshman year and it was one of the best decisions I have made at SJU. I was surrounded by individuals who are passionate about our school and who helped me find a sense of belonging as a freshman. It was a way for me to get involved on campus by meeting people at all kinds of sporting events whether it be soccer, lacrosse, basketball or baseball. Having students be so invested in our school and its sports always gives us a fun activity to do on weekdays or weekends to unwind after a stressful day. I cannot emphasize enough how important the school spirit and campus culture is to me. Without a great campus atmosphere or being passionate about your school, I truly do not think you get the full college experience. Not every school has it, but SJU does and I am thankful every day to be a Hawk because of it.